The success of your upcoming residential or business removal will more or less be determined by how well you handle the packing stage of your relocation. And while you may have the necessary skills to meticulously pack your belongings if you lack the right materials you will certainly fail to tackle the job correctly which will lead to unwanted results such as damaged or broken items. 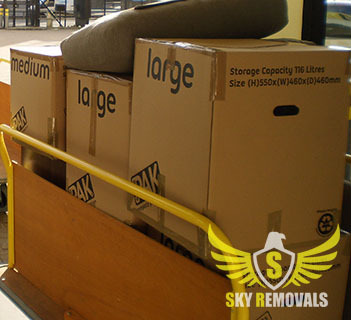 Fortunately for you, we from Sky Removals are here to lend you a hand by providing you the best possible packing supplies. We offer a wide selection of materials to our clients with which they can pack anything from small and delicate items to large and bulky objects. The packing supplies that we use and offer to our customers are eco-friendly and fully recyclable, and we provide them at very reasonable prices which won’t harm in any way your removal budget. The best aspect about choosing to get your packing supplies from us is that we from Shy Removals will bring them to you. Yes, you won’t have to come and pick them up as we are ready to deliver them to you at a location and time of your choosing. You can order your packing materials at any time of the day as we maintain a 24/7 customer support centre. Our phone operators are knowledgeable and friendly professionals who will explain you in details the different qualities of our packing materials and who will gladly answer to all your questions. Also, don’t be shy ask about our other man with van services because it may turn out that we may help you in more than one way with your upcoming domestic or commercial removal. Keep in mind that if you combine several of our services in a bundle you will take advantage of our special discounts. Also, make sure that you request your personalised quote. Our quotes are free of charge and obligation. Our website utilises cookies, so please visit this and this links to learn more about their usage. Continue browsing if you agree.